1 — Percentage, 100% by Y1/2% — for cracked and damaged grain, foreign matter, etc. 2 — Grams, 200 grm. by 2 grm.— for weighing samples for moisture tests, etc. 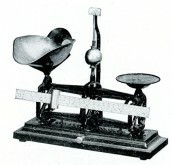 3 — Avoirdupois — 8 3/4 ounces by 1/8 ounce — for ordinary weighing.